How can you calculate the correct size for your new furnace? This can be done by the contractor who calculates the heat loss for the home using a method which is available from government as well as private sources. This takes a number of hours to do and is fairly costly. The goal is to find a relationship between the gas consumed and the heating degree days (HDD). A heating degree day is essentially the number of degrees of heating required over the course of 24 hours, compared to a reference temperature of 18°C. For example, if the average daily outside temperature is 10°C, then the number of heating degree days for that day is 18°C - 10°C = 8 HDD. You can get the approximate HDD for your calculation period from the Environment Canada website. Use the data from the “Degree Days: Below 18°C” row. Once the relationship of the HDD and gas consumption is established, then you can calculate gas consumption for the design temperature in your area. This temperature is usually available from a mechanical contractor or your local building officials. It is not the extreme minimum temperature; it can be estimated from the average temperature over 24 hours on the coldest day of the winter. To approximate the design temperature: go to the historical weather data for your community on the Environment Canada website; find the coldest January over the last several years; then pick out the lowest daily average temperature in that month; and use that as the design temperature. Being a degree or two out will not make a huge difference in the calculation. If you are calculating for an oil furnace, heating oil has an energy content of 38.2 MJ/litre. * Note: This calculation is correct, although many people think the efficiency factor is in the wrong place. It is not. We are calculating the house heat loss based on fuel used and furnace efficiency. A more efficient furnace will have delivered more heat to the house, and the heat loss will be higher." The source of the above material is the CMHC website. 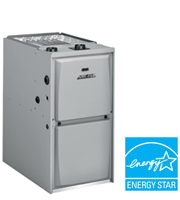 Furnace service is necessary if you want to have a warm and comfortable winter season. The best time to have furnace service is during early fall. Do not make the mistake of having to call a furnace service company in the middle or even at the start of the winter months.